Looks like there’s a serious attempt at sneaking GM food into Britain via the backdoor. And it has to be the backdoor, of course, because in the EU we still have GM labeling. There is still a large feeling against GM foods in the UK. This arose as a result of the findings of Dr Arpad Pusztai which indicated that rats fed on GM potatoes developed compromised immune systems. Hence the labelling laws. Incidentally, Dr Pusztai was removed from his position and his team disbanded, presumably because he got the wrong results! As a vegan I often ask the question”what’s in this, please” when buying food. It’s a reasonable question and I use it often. 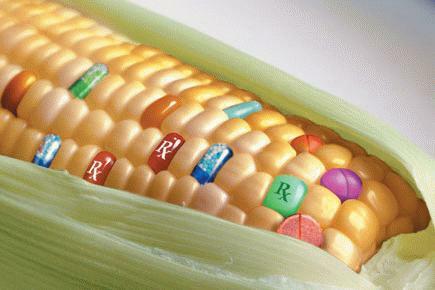 I am certainly keen to know if GMOs are in my food, I tend to avoid them if possible. Meat eaters are beginning to wonder about what’s in their meaty food products too, given the recent horse meat scandal. It’s outrageous that manufacturers often don’t seem to know what’s in their products or where the ingredients have come from. The once vegan only question of “what’s in this, please” is becoming of more importance to meat eaters, especially given further developments aimed at getting GM food in via the backdoor. Largely unnoticed, British supermarkets have agreed to sell GM fed meat products. These will not be labelled as GM because the animal itself has not been genetically modified. Supermarkets claim these products are safe and there is a shortage of non-GM animal feed. But are they telling the truth, the whole truth and nothing but? They are calling for clear labeling so consumers can make an informed choice. Seems very reasonable and shame on the supermarkets for not providing it. Of course, as a vegan I’m not affected directly, but it’s a worrying step in completely the wrong direction. You can read a lot more about this issue and efforts to oppose it on this Facebook event page. Significant blockage means that public and MEP opinion is against GM food! Moving the EU forward means getting GM food and crops into Europe. The coalition government IS in favour of GM food, according to the GeneWatch site, which tracks these things. While there are campaigners against GM food, this gradual edging towards an introduction of GM food via backdoor tactics is an example of Machiavellian political maneuvering. Lobbying from the corporations gets the wheels turning and the tactics begin – scare the public, suggest alternatives are undesirable, introduce the desired policy. That’s a small step, only a small step but if we keep ‘em peeled we can help prevent GM food via backdoor tactics ruining the food chain for future generations. Brilliant book, well written and researched in depth! Pingback: Prop 37, what's it got to do with us?